The Purple4Polio Rotary Grand Tour hit the highways in May, with over fifty registered teams and their fabulous cars taking part. Vehicles of all shapes and sizes toured the country, raising money for End Polio Now as well as sharing the story of Rotary along the way. This adventure around Britain took place from 21st until 24th May and featured some very quirky vehicles including a former builder’s truck which has had a major facelift. The teams had a fun challenge ahead as they organised their own routes, transport and accommodation. To help the intrepid travellers on their way, Rotary across the country had set up a few check and photo points at places of interest where teams could have a break, get the logbook stamped or take a selfie near a landmark. One of the scheduled stops was in Monmouth, where perfect sunshine and District 1100 DG Alan Hudson were was on hand to welcome those Rotarians participating in the Grand Tour. Congratulations to South Foreland Rotary Club's two bestickered cars and to the teams who posed in front of the famous historic Monnow Bridge before departing for their next destination. 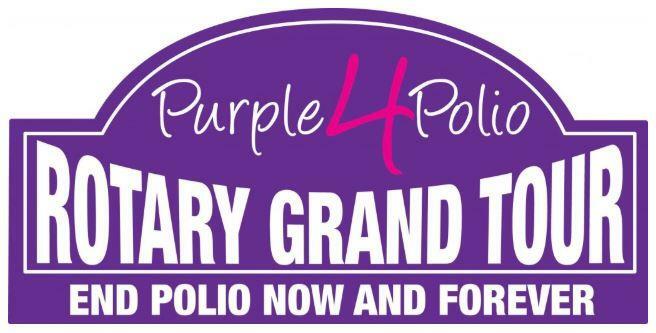 For further details of the Purple4Polio Rotary Grand Tour click here.